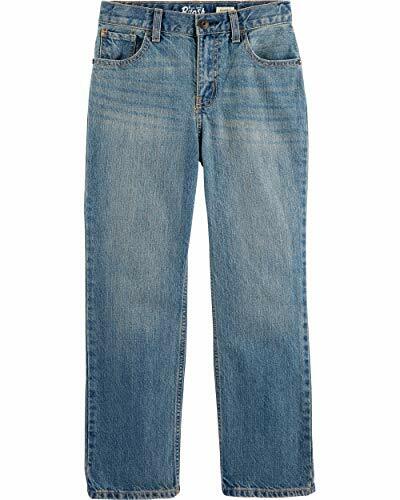 Keep him looking like an American classic with these Levi's 505 regular fit jeans. We've designed these jeans with rip and repair distressing throughout, classic 5 pocket styling and arcuate stitching at the back pockets. This Levi's 511 jean is designed for peak performance, and offers a comfortable, regular fit from the hip to the ankle. It also features our signature 5-pocket design with arcuate stitch on the rear spade pockets for a classic look he'll love. Made from soft, stretchy denim and 23 percent recycled plastic bottles, it increases his mobility and is eco-friendly. Moisture wicking fabric keeps him dry and comfortable, while the soil release feature easily gets rid of stains when washed. The ultimate skinny fit for guys, our 510 skinny fit jeans are our skinniest fit in our range, cut to fit close overall and designed with a little stretch for extra mobility. Sits below the waist and skinny from hip to ankle. Sizes 12 and smaller feature an adjustable waistband, so you can tighten them when they are too big and let the cinch out when they are getting tight. Comfort meets classic style in the Levi s Boys 514 Straight Jean. Whether his idea of fun is baseball, scouts, or his gaming system, you know he ll look and feel great in these. The Levi s Boys 514 Straight Jean sits just below the waist and features a generous, straight-leg design. Made of 100% cotton for a fit that s as comfortable as it is classic. The 511 Skinny has now become the 511 Slim. It's your same favorite fit with an updated name. Please note, due to this change, you may receive this product marked with either Skinny or Slim tags. Style's not something you think about; it's just a way of life. Keep on keepin' on with the signature Levi's 511 Slim. The 511 is cut close through the thigh with a slim, lightly tapered fit through the leg. Slouch-cut low rise sits just below the waist. Five-pocket design with signature arcuate stitch at back. Leather brand patch at back waist. Belt loop waistband. Zip fly and button closure. 99% cotton, 1% elastane. Machine wash and tumble dry. Imported. FREDD MARSHALL aims to offer customers a variety of the most fashion and original style to make them unique or personailzed in the whole season and committed to make their life more beautiful and tasteful,by trying our best to serve them with heart and soul.And we are always on the way! 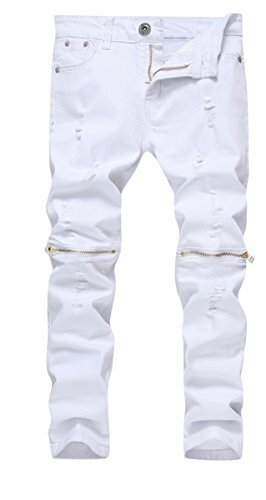 Boy's Slim Fit Skinny Ripped Distressed Zipper Jeans Pants with Holes Size 5: waist: 20-21in Hip: 25in Length: 26-27in Size 6: waist: 21-22in Hip: 26in Length: 28-29in Size 7: waist: 22-23in Hip: 27in Length: 29-30in Size 8: waist: 23-24in Hip: 28in Length: 31.49in Size 10: waist: 24-25in Hip: 29in Length: 33.07in Size 12: waist:25.5-26.5in Hip: 30in Length: 35.43in Size 14: waist: 26.5-28in Hip: 31-32in Length: 37.79in Size 16: waist: 28-29in Hip: 33-34in Length: 39.37in Please Note:all dimensions are measured by hand,2-3cm error is in the normal range so please check your boy's measurements to make sure the item fits before ordering.Thank you! 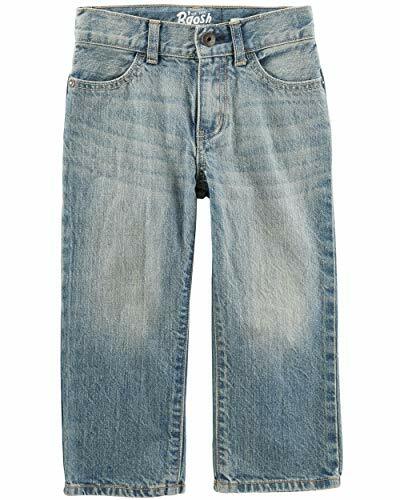 This Boys' Relaxed Straight Jean from Wrangler is a must-have, classic style, made with the durability and quality you've come to expect. Perfect for school and play, this jean featrues an adjust-to-fit waistband to maximize comfort all day! Pair with any cool top for a great look. RELAXED FIT. Comfort is key for a day of play at home or school. These Wrangler Relaxed Straight Jeans are built with a relaxed seat and thigh for movement, an updated straight leg for style, and sit at the natural waist for a comfortable fit. BUILT TO LAST. Made with cotton and cotton rich fabrics, these jeans will withstand hours of play. 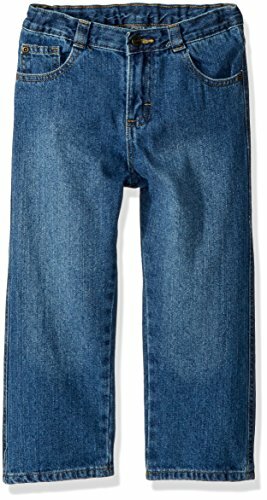 They are sure to become the go-to jean with any of his favorite tees. CLASSIC STYLE. This traditional five-pocket jean is made in a relaxed fit to keep him comfortable throughout the day, with a classic denim look that's timeless. FUNCTION MEETS STYLE. 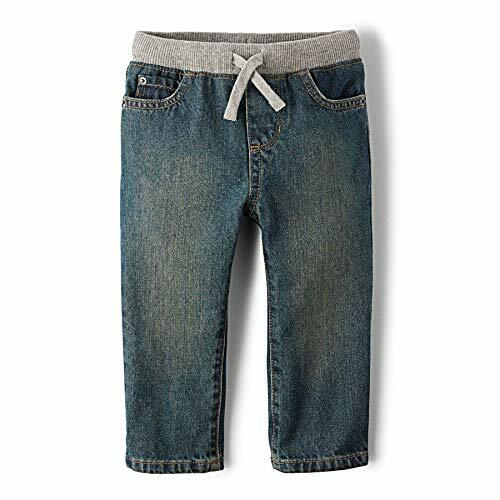 This classic boys' jean is built with room for everyday running and tumbling and a convenient adjust-to-fit waistband for a perfect fit. QUALITY HARDWARE. Finished with a zipper fly, snap closure for little boys, button closure for big boys, Wrangler logo rivets, and signature Authentics embroidered back pockets. 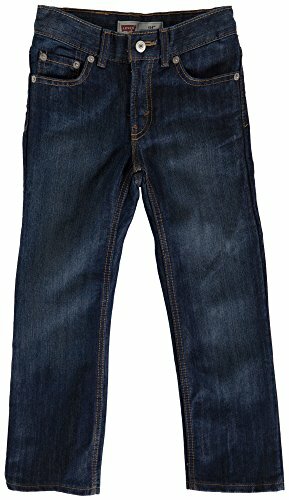 Top Quality Designer Boys Kids Denim Jeans Trouser Size 2 3 4 5 6 7 8 9 10 11 12 13 14 15 16 Years. 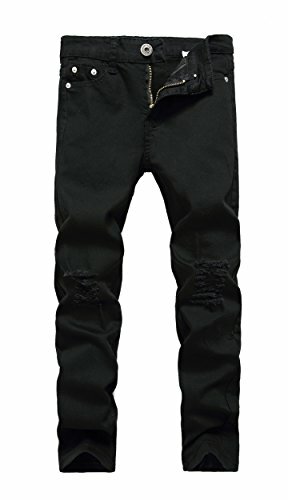 Durable SMART JF4You Jeans Trousers. Button Fly and Zip Closure. Great Gift Idea. Superb Quality. COTTON Durable SMART Jeans. Sizes Available for All Children, Toddler, Younger and Older Boys. You will get 1 Quality made Jeans. All pictures showing colour variation or illustrating front and back views is to show available options Kindly select your jeans size age 2 3 4 5 6 7 8 9 10 11 1 2 13 14 15 16 or colour from Blue Black Faded Blue etc before payment for 1 pair of jeans. Please search our store justfound4u from amazon to see our other lovely items for children and adults. PREMIUM METERIAL--75% Cotton/25%Polyester, made of this premium fabic, it can ensure its good stretch while keeping durable and being comfortable. 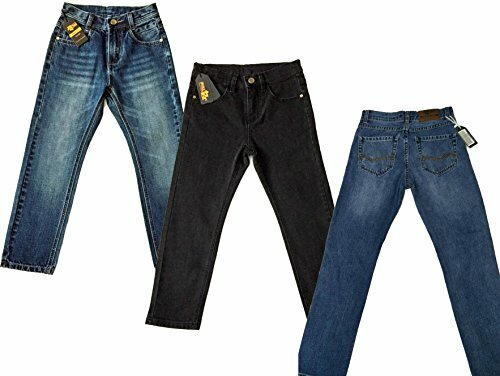 Our Qazel Vorrlon boys jeans will not be fading and Shrinking easily and show its long-lasting performance, machine washable. 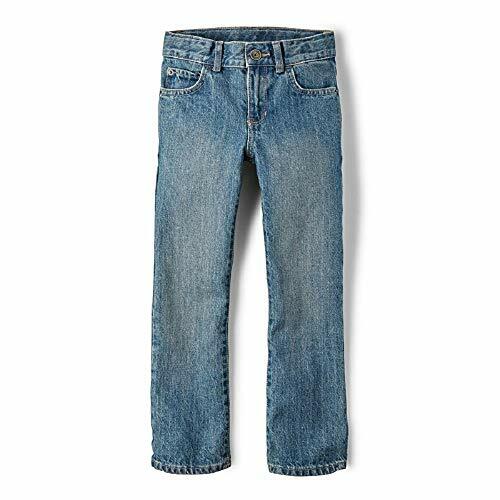 Any OCCASION--With its comfortable elastic fabric, regular rise and light wight, our Qazel Vorrlon boys skinny jeans is the best choice for your boys' daily wear, such as school, outdoors, family dating, trip. Your boys are always in his element with our jeans. CONVENITENT--High quality buttons and zipper make your kids more convenient to wear. Not too tight but stability. With five Pockets style design, two side slanted hand pockets, two rear patch pocket and one small pockets, it is convenient for you to put anything belong to you in the pockets, such as Student ID Card, Phone, wallets, Keys and so on. Care Instructions and Guarantee--Every item was protected by our brand Qazel Vorrlon. You could return it to us within 90 days if you are not satisfied with it. Or you could contact us with Amazon Message, we will do our best to help you solve your problem.